THE BEST-selling LC/MS/MS in history is how AB Sciex describes its API 4000, and so creating a replacement instrument is clearly not something to be undertaken lightly. 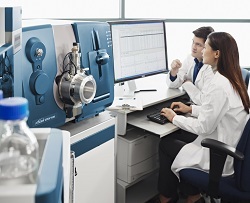 The new 4500 series, unveiled this week at Pittcon 2012, is intended as the new workhorse for routine quantitation and screening and claims ten times more sensitivity that competing triple quadrupole instruments. This ‘re-engineered’ system was developed using feedback from top scientists and application experts in analytical science. It adds AB Sciex’s Qtrap technology for simultaneous quantitation and library searching, which is said to greatly increase full-scan sensitivity. By incorporating what the company says is the world’s most sensitive linear accelerator trap, Qtrap promises one hundred times the sensitivity of basic triple quadrupoles for ‘unmatched’ confidence in screening results. “The AB SCIEX 4500 series is best in class for analytical scientists needing a dependable LC/MS/MS workhorse system to deliver results they can trust ,” said Rainer Blair, President of AB Sciex.